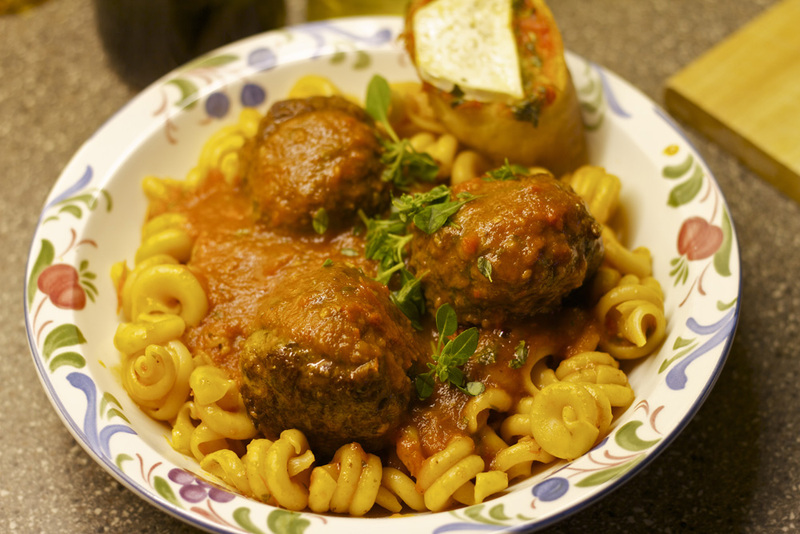 timmys meatballs….insert joke here. I’ll try to keep the innuendos down to a minimum. Now I had a bit of a stroke of genius with this meal. We bought some garlic bread to have with it but I decided to get a bit funky with it, I’ll get onto that soon. This recipe is split into three main bits and is really easy to prepare. Especially if you’re cooking for a few people. If you’re not so good with cooking for lots of people and get stressed out with timings this meal is so easy to time. It looks likes there’s a lot to it but it really isn’t hard. Ok so first we’re going to do the meatball mixture. This will feed 4 people. For this you will need. 850 grams of pork mince The choice of mince is up to you though. You can use beef if you’d prefer. If you’re at your butchers then ask them good quality mince. Pork shoulder meat is great for this. 1 handful of bread crumbs you can make your own if you have some stale bread or most supermarkets sell bread crumbs. 1. In a large bowl put the mince, the onion, parmesan, garlic, herbs, chorizo, large pinch of salt and pepper. Mix well with your hands then crack the egg in there and the hand full of bread crumbs. Make sure you mix really well. If you want to make it a bit spicy I like to add a finely chopped fresh red chilli. 2. 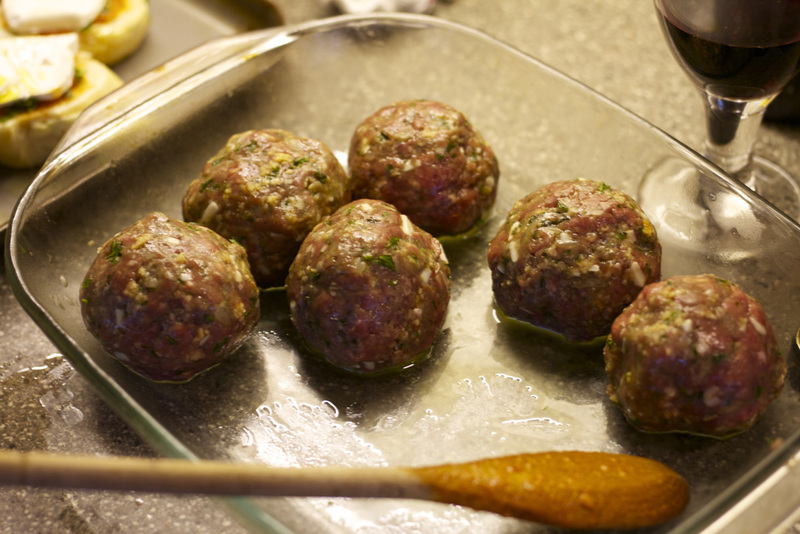 Now get a plate or a pyrex dish drizzle a tiny bit of olive oil and make the meatballs using your hands. You can make them as big you like really. Some people like big meatballs some like them a bit smaller. A tiny bit bigger than a golf ball is good. If you do them that size you will get about 10 meatballs. Put them on the plate as you make them. Once all done give a final drizzle of olive oil and cover with cling film and pop in the fridge. At least half an hour is good but you can do this a few hours before or even over night. Right onto the sauce. Really simple. You will need. 2 tins tomatoes chopped or whole is fine. 1. Ok so in a roasting tray add the peppers, tomatoes and garlic. Drizzle over the olive oil and add the salt, pepper, oregano and paprika. Just a sprinkle of each and mix well. Chuck in the oven on about 220°C for about 15 mins. 2. Remove from the oven and put in a deep sauce pan, add two tins of tomatoes and whizz with a hand blender. If you don’t have a hand blender then I’d recommend getting one as they are really useful. If you don’t want to get one you can use a masher. 3. Bring to a simmer and taste. Season with salt and pepper if needed. If the sauce tastes a bit sharp and acidic then add some nice brown sugar. Just a bit at a time. 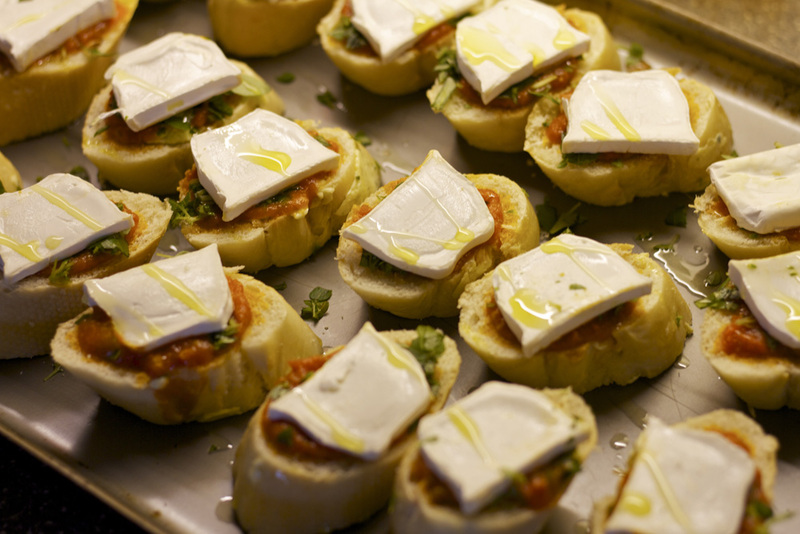 You want a bit of sweetness as it really helps to bring out the taste of the tomatoes and balance the acidity. Add a bit of sugar, stir and taste. You don’t want it too sweet. Add more if needed. If you are very lucky and live in an area where you can get proper tomatoes you probably wont need to add much sugar. 4. Just leave this to bubble on a very low heat. Ok so now get the meatballs out the fridge and put frying fan on a medium to high heat. Add bit of oil to the pan and add 3-4 meatballs at a time and brown off a bit on each side. no more than 2-3 mins per meatball. Remove form the pan and repeat with all the meatballs. Once they are all done add them all back to the frying pan and add about quarter a bottle of red wine. Let it bubble for about 3 mins then add everything to the tomato and pepper sauce. Just let this simmer on a low heat. Just before you serve add some fresh basil to the sauce. Just tear it up a handful and stir through the sauce. 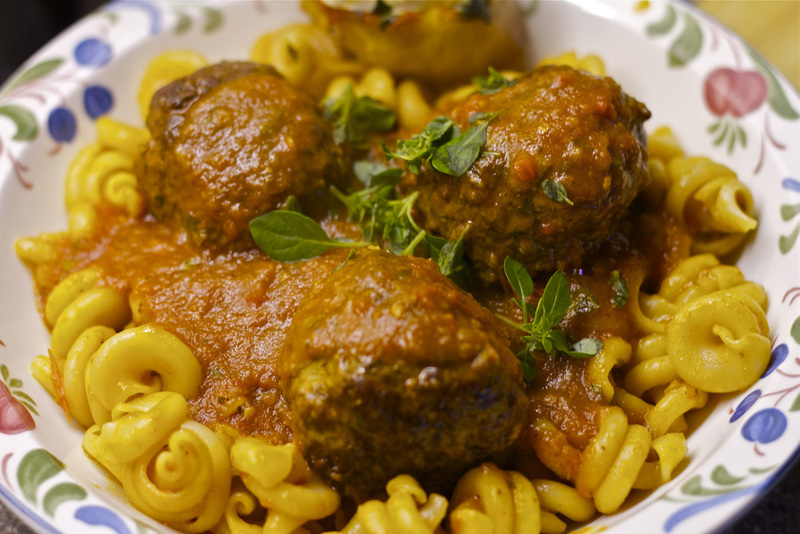 As soon as you have put your meatballs in get your pasta on. Add water to a deep sauce pan and add salt. You do need quite a bit of salt for the water. One it is boiling add the pasta, stir and bring back to the boil then give it about 10 mins. Give it a stir every few mins. Cooking time does depend on the pasta so read the instructions on the pack. You want a slight bite to it. Drain, add back to the pan and season with a tiny bit of salt and pepper, a drizzle of olive oil then add a couple of spoons of the sauce and mix. Right now we are going to do the cool garlic bread for this dish. You can have it as a starter if you’d prefer. If you’re serving it with the meal then you need to put this in when you get the pasta on. This is great for little nibbles if you’re having people over for drinks as well. ok so you will need. Garlic bread for this you can just use the garlic bread you can buy from the supermarket. I’ve used 2 of these. You can do it yourself with a baguette and some garlic butter. But if you can’t be bothered then this works really well. Goats cheese cut into slices about 5mm thick. Work out how many slices you need for all the bits of bread. This will dictate the thickness of the slices. I would say that more than 5mm thick and it might be a bit over powering. Goats cheese is quite a strong cheese. 1. ok so if you are doing this with the pre made garlic bread get a knife and cut it down the pre cut slices and lay the slices on a baking tray. 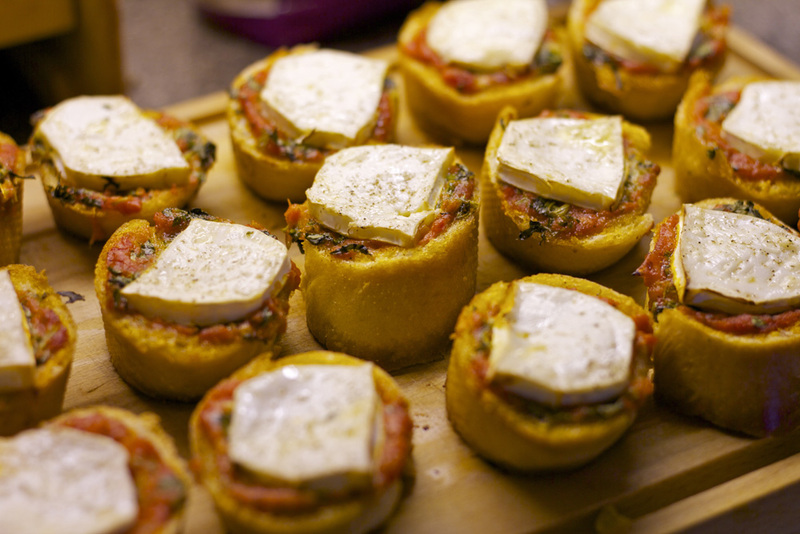 Now with a small spoon put a spoonful of sauce over each slice then add a pinch of basil then a slice of the goats cheese. season each one with a bit of pepper then do a quick drizzle over the slices with the olive oil. Put in the oven and give it 15 mins. So tasty and simple.